they are almost like countries within a country. 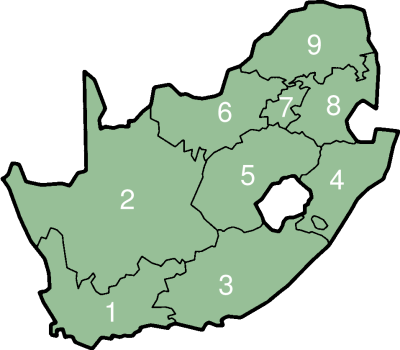 Prior to when the 9 new provinces of South Africa, as we know them today, came into being, South Africa consisted of only 4 provinces. They were the Transvaal and the Orange Free state, previously Boer republics and Natal and the Western Cape Province, which were once British colonies. Strewn across the country there were also the apartheid "homelands", kind of artificial states based on tribal identity, to which the black people were forced to have citizenship and relinquish their South African citizenship. The change came about in 1994, after South Africa's first free national elections and subsequent transition to a new and free democracy. The new democracy also brought a change in the administrative structure of the new provinces. Together with a large degree of self-government, each province received its own legislature, executive council and premier. South Africa,s rainbow culture shows in the incredible diversity between these new provinces, almost like separate countries within a country, each one unique with its own characteristics and dynamics. Let us go and visit them, just click on the province of your choice in the menu below. The numbers correspond with those on the map underneath the menu. Tips for navigating the interactive maps below. 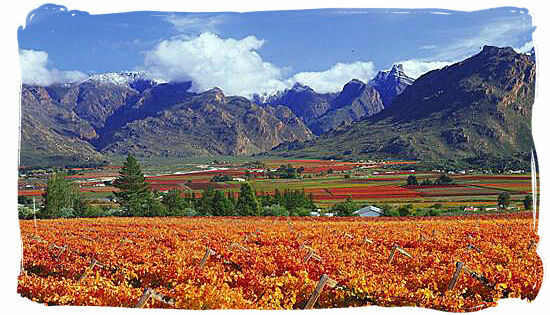 The Western Cape Province is known as a place of great splendour and natural beauty. Boasting a fantastic climate and extraordinary scenic beauty, combined with some of the world's greatest beaches, a remarkably rich history, a fabulous food and wine culture and wonderful people, this province offers almost everything you can wish for as a tourist. Towering majestically over the city of Cape Town or the "Mother City" as local South Africans fondly like to call it, is the world renowned Table Mountain, a spectacular backdrop to this beautiful city and the whole of the Cape Peninsula. White sun-drenched beaches, endemic forests of ancient trees, nature reserves and beautiful valleys with vineyards and orchards between rugged mountains forming the scenic background to art festivals, craft markets and historical buildings, await those who come explore this province. Great experiences like tasting our famous wines right there where they grow, watching whales and dolphins rollick in the sea, riding ostriches, swimming with penguins, standing in Nelson Mandela's prison cell, watching Jaws the awesome great white shark from an underwater cage and taking the cable way to the top of Table Mountain, will make your visit absolutely out of this world. 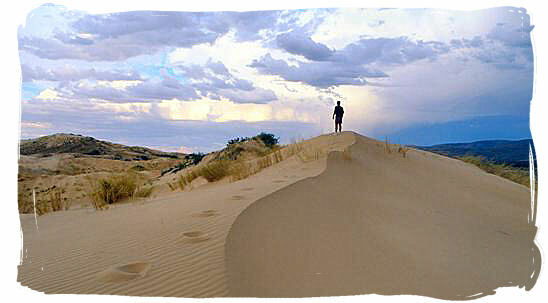 Those who love the rough and arid countryside of the Northern Cape Province, call it the jewel of South Africa. Looking at it makes one wonder what it is that holds so much fascination for them. But after a while one realizes that there is more than meets the eye and that the first impression of a desolated ancient land only goes surface deep. Northern Province certainly has its own unique attractiveness amid the other South African provinces. Below that seemingly desolate surface great riches is has been found in the form of large deposits gem stones such as topaz, opal, garnet, jasper, rose quarts, agate and last but certainly not least, diamonds. Which is why it is often named the jewel province. Above ground on its surface the province is home to awesome wildlife and scenery richness such as: Vast open plains and rust-red dunes tinted in the golden tones of the sun with roaming herds of antelope and the annual springtime explosion of brilliantly coloured flowers in Namaqualand. It is also home to four of South Africa's 20 national parks featuring a wide range of wild life including the Big 5 and Last but not least the mighty Orange river in the north with its famous Augrabies falls, the world's sixth largest waterfall. Fun in the sun along 800 kilometres of glorious and exotic Indian ocean beaches is what the Eastern Cape Province has to offer as one of its major attractions. Starting at the Tsitsikamma National Park, it extends all the way up the golden sunshine coast, which includes Jeffrey's Bay, St. Francis Bay and Algoa Bay, continuing along the wild coast to Port Edward. The long expanses of sun-drenched beaches interrupted by rocky coves and secluded lagoons makes it a paradise offering the perfect wave to surfers, king-size catches to anglers and glorious sunshine to holiday makers from all over the world. For those who are in the mood for something different, the Eastern Cape is also home to a number of great national parks where one can view a variety of wildlife, including the Big Five, in a natural and malaria free environment. Some of the other provinces of South Africa are not entirely malaria free. If history and culture appeal to you, then you will find that visits to Nelson Mandela's place of birth Qunu, the rock painting sites of the ancient Khoi Khoi people, the 19th century town of Graaf-Reinet with its close by Valley of desolation and the historic Anglo-Boer war battle grounds, are no doubt hot items that will make your visit to the Eastern Cape province a memorable one. When you visit the Zulus on their home ground amid the kraals, original dwellings and burial sites in the Zulu Kingdom in the north, you will feel the beating heart of a proud nation. Like the other provinces of South Africa, Kwazulu Natal with its lively and striking contrasts is a melting pot of Indian, European and Zulu cultures. The east coast which extends further upward from Port Edward to the national border with Mozambique is part of the Kwazulu Natal province. 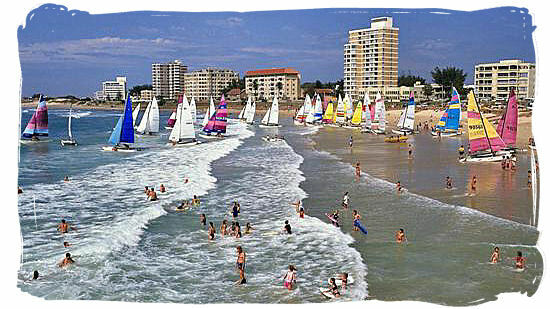 Because of the subtropical lush and green environment it is often called the garden province. In and around Zulu land one finds the legendary battle sites of the Anglo-Zulu and Boer-Zulu wars, where history makes you think and reflect at the exact places where Zulu warrior, Boer guerrilla and British soldier either died or survived during their heroic three-way battle for dominance. The province's subtropical paradise coast with its golden sand beaches and warm Indian ocean waters, offers many leisure activities such as snorkeling, scuba diving, swimming, angling or just relaxing in the sun. Kwazulu Natal is home to two of our four world heritage sites, the greater St Lucia National Park and the uKhahlamba Drakensberg Park with its impressive and magnificent mountain scenery. Coming across the Orange river into the Free State, the vista that will unfold in front of you is one of immense grassy savannas and never-ending fields of maize, sunflowers and wheat, dotted with windmills and farmsteads. Free State province is known as the granary province of South Africa. Embraced by several of the other provinces of South Africa, the Free State province is situated between the Vaal river at its northern boundary and the Orange river at its southern boundary, in the middle of South Africa. Home to more than 30,000 farms, producing more than 70 % of grain and corn consumption, it is locally known as South Africa's bread bin. The scenic beauty of the eastern highlands reaches a climax when you come to the Golden Gate National Park with its spectacular sandstone formations, an area of extraordinary scenic beauty. Close to 340 days of sunshine per year makes this province a haven for outdoor enthusiasts, offering activities such as game viewing, mountaineering, horse riding, 4 x 4 trail and mountain biking, to name a few. The dams and rivers provide many water sport opportunities, like angling, river rafting and canoeing. From the major cities to the rural village townships, the friendliness and hospitality of the people are overwhelming. The province boasts two of South Africa's major national wildlife parks, the Pilanesberg national park and the Madikwe game reserve, worlds of endless African savannah and breathtaking wildlife scenery. North West province,...the platinum province. Aptly named, because this member of the nine provinces of South Africa produces more platinum from its rich resources than any other single area in the world. For those drawn to the Africa wilderness, North West is all about the authentic African bushveld experience, with its all year-round sunshine and hot dry African climate. A journey through the wild Pilanesberg mountains brings you into the bowl of the crater of an extinct volcano, where you will find one of our country's world renowned attractions. Known as Sun City and Lost City, they are South Africa's answer to Las Vegas, a fabulous resort complex in the middle of an uncultivated African savannah landscape where the Big Five are roaming. The province is also home to a well known World Heritage site called the Sterkfontein cave complex, also known as the Cradle of Mankind. An abundance of hominid fossil remains were found here, dating back up to more than 2 million years according archaeologists. Gauteng province - Place of gold. In 1886 an unemployed miner stumbled upon a stone bearing traces of gold. It started the Witwatersrand gold rush. The history of gold in South Africa became the history of Gauteng. Gold rush shantytowns developed into some of Africa's largest metropolitan cities; Johannesburg, the capital of the province, Soweto, the heart of the freedom struggle, Pretoria, the administrative capital of South Africa, and the Vaal Triangle, an industrial heartland. 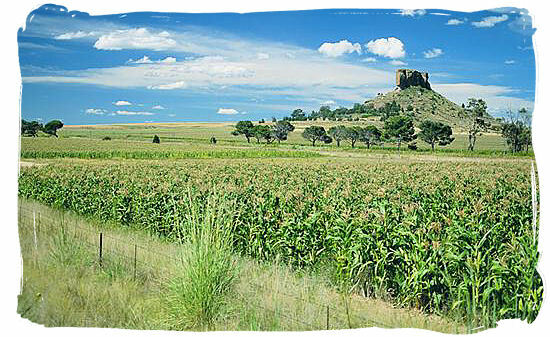 Together they form the small and densely populated province of Gauteng, the Sesotho word for "place of gold". 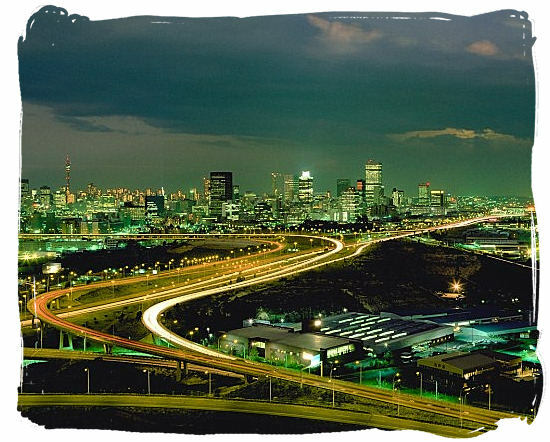 Johannesburg skyline at night, capital of Gauteng Province, place of Gold. With its high population density and economic wealth Gauteng is the economic heart of South Africa and a renowned shopping Mecca, offering some of the world's best shopping in the southern hemisphere. Although it is the smallest, richest, loudest and most urbanized of all the provinces of South Africa, you will find a wide variety of holiday destinations. It is home to the famous world heritage site known as the Cradle of Humankind at the Sterkfontein cave complex. A wealth of hominid fossils were found here, dating back more than two million years according to archaeologists. Last but not least the province is also home to the old mining town of Cullinan, where the world's largest diamond, the Cullinan diamond of 3106 carats was found. 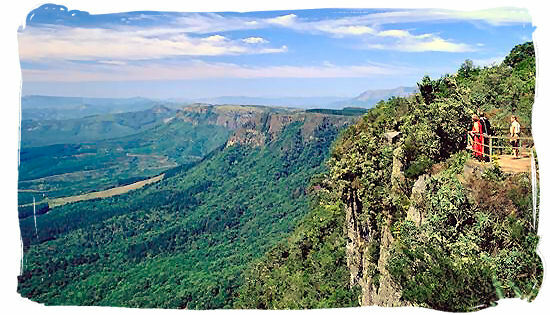 Mpumalanga is blessed with the spectacular Northern Drakensberg escarpment with its sheer cliff faces plunging straight down to the Lowveld, nearly a 1000 meters below. Extraordinary impressive, compared with the other provinces of south Africa. Mpumalanga province, the place of the rising sun, when one translates it from the local SiSwati language into English. This province with the sheer splendour of its immense natural beauty and some of South Africa's most diverse and vibrant cultures, has it all. From one of the most exhilarating wildlife areas in Africa, to spectacular mountain retreats, ancient ruined cities and villages and wild water sports. Its lowveld African savannah landscape is known as one of Africa's most astonishing and exciting wildlife and game viewing areas, with many wildlife reserves, provincial and national parks, including the southern half of the famous Kruger National Park. The province is also home to vast forestry plantations of exotic trees such as pine, gum and wattle that cover the mountain slopes. It is rich in history with a legacy of historical well preserved gold rush towns and the Sudwala caves with their astonishing archaeological discoveries, to name but a few. Mpumalanga will fulfill anyone's dream of the true and genuine African experience. Limpopo province, the great north. This province is named after the Limpopo river that forms its western and northern boundary. Looking further than the first impression of an endless landscape sweltering in the heat of the African sun, you will discover the great natural splendour of the African bushveld together with its extraordinary wildlife population. Limpopo houses a large number of game farms, private and provincial game reserves, adjoining the northern part of the renowned Kruger National park at its eastern border. The Africa experience of game viewing and tracking the Big five is absolutely fantastic here, probably the best of all the nine provinces of South Africa. Then there are the famous hot spring resorts where one can have the heat quenched and the muscles softened in the tranquilizing consolation of warm mineral baths. 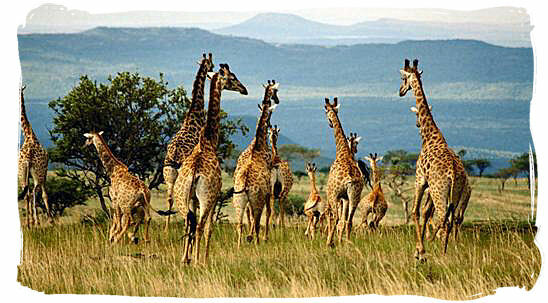 For those people who would like to experience the real Africa atmosphere, Limpopo province is the place to go to. But there is more. 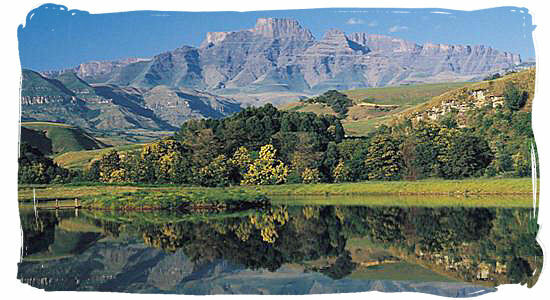 There are the cultural and historical heritage sites in the Makapans valley ranging in age as far back as three million years according to the scientists - The land of the mysterious Rain Queen Modjadji, with her extraordinary rainmaking powers - and ancient indigenous forests and great mountain ranges rising up from the endless expanses of bushveld wilderness.